With a family of 6 and us all being busy it is essential to my household running smoothly that I plan our meals. Great meal planning will help you save time, save money and reduce the amount of stress and thinking that goes into cooking great meals. Meal planning is really very simple and takes me about 30 minutes to an hour a week not including my grocery shopping time. My shopping trip time is cut short too because I already know what I am buying. I do not have to stand in the middle of the grocery store trying to figure out what to buy since it is already planned and ready to go! To make your meal planning easier I have a FREE Meal planning printable pack you can print here. It includes a planner, shopping list and budget to help you. Tip #1: Plan what meals you need to meal plan for. How you need to plan your meals and what meals you need to plan are going to depend on how your household works. This will be different for everyone because everyone has different eating styles however for the most part it is the same as well. Some people like to plan out every single meal of every day for the whole week. Others only plan dinners and spontaneously cook breakfast and lunch. 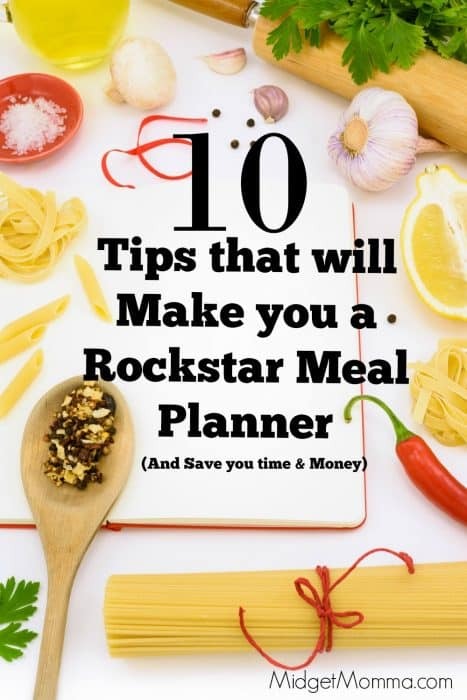 Others plan all of their meals for a whole month (I wouldn’t suggest that until you have mastered what works and what doesn’t doing meal planning for a few weeks, doing it weekly first). You should plan any meal that’s going to be elaborate. If you’re regularly cooking big elaborate lunches, you should include those in your meal planning. However if lunch at home is scrambled eggs and toast, then there’s no need to do much planning. I do like to write down the lunch and breakfast options that I have on hand and “rough plan” them but you don’t have to. Sometimes simple meals like baked spaghetti more than do the job. Trying to cook an elaborate meal every night of the week is a sure recipe for disaster. You will be worn out, the dishes will never be caught up and you will have a TON of stress. Plan your simple meals on the nights you know you are already going to have stressful things, this way you are not adding more stress to your plate. Tip #3: Pick Two Recipe Sources. It’s very easy to get sucked into the world of recipes, especially when you’re just getting started with meal planning. Pinterest has made it possible to find hundreds and thousands of recipes on anything from Fire Cracker chicken to lasagna to Apple Pie Oatmeal. If you’re not careful, you could easily waste hours and hours and hours in front of the computer browsing recipes, when 10 minutes would have done the job. Spending too much time browsing recipes will lead to overwhelm. You’ll have so many choices to choose from that it makes it difficult to pick any one thing. We have a HUGE selection of recipes here and we have over 600 recipes that you can use in your meal planning. If you are planning breakfasts, Checkout this list of breakfast meal planning ideas. Tip #4: Create a Shopping List. Creating a shopping list is going to save you a TON of time when you are at the grocery store. It will also save you money because you will not be buying items that you already have in the pantry or fridge. To get started making your shopping list, get your list or recipes you are making and list all the ingredients on a list. Then go through your fridge and remove any items from your list you already have. Even if you think you know exactly what’s in your fridge, it still helps to look through to double check, I have quite a few times thought I had things and then got home from the store only to realize I didn’t have enough of it. Then add any additional items you need to replenish, even if they weren’t on your recipe lists (E.g. milk, eggs, flour, etc.). Once you are done making your whole list, grab the local store ads to see if anything you normally keep on hand is on sale or at a stock up price. You want to put these items on your list when they are at the lowest price you can get them for because it will help you save time and money in the long run. Buying when things are on sale can help you and your family save a lot of money. You can always find coupons in the newspaper and you can also print them out here. When you are doing your shopping you might find foods on sale that weren’t on your list. If you think you could cook up the foods anyway though, go ahead and buy them in bulk and then change your meal plan later. Buying bulk foods are not the only way that you will save money when you are doing meal planning, check out how meal planning will save you money to find out even more ways that it will help you save. The easiest way to use leftovers is of course to just stick it in the microwave, and I love doing this at the end of the week because there is normally plenty of food to feed us all. Sometimes I heat it all up and just put the containers on the table and other times we plate it and heat it up per person. Either way works and it is also a great way for everyone to have something that they loved from earlier in the week again. If you know you are going to have a night or 2 each week that is fully on crazy, then plan your meal plan to include that and make it so each meal you make the previous days will have left overs. When you are a mom there are times when life is going to get in the way. You will have an amazing plan for dinner and then BOOM that goes down the tank! Whatever the reason, sometimes you just won’t be able to cook, don’t beat yourself up for it and it will be so much easier when you have a plan in place just for situations like this. Not only does this mean you will have left overs, which are great for lunches but cooking more than necessary can also give you nice side dishes for other meals. For example, if you have a few chicken wings left over, they can make a good appetizer. Or you might give each person a couple chicken wings to add more taste to a meal. Get the kids cooking with you! It is a great way to have them learn how to cook. Plus it makes them more interested in trying new foods since they were a part of cooking them. No one likes to eat the same things all the time and we all like to try new recipes. But as we all know that can take a bit of time and sometimes does not always end up as planned. Instead of experimenting with new meals each night pick one meal a week to be the “experiment” meal. Have it be on a day when you know you will have extra time and then if it becomes a big hit for dinner add it to your meal planning for future meals. If it is a flop then you know not to make it again, but really no one wants to take the chance on a meal every night that could flop. These experimental meals should be outside the box of what you normally cook. For instance, if you normally do stir-fries, why not try to bake a quiche? If you regularly make your meats on the stove, why not try a baked chicken instead?